Comm Eye Health Vol. 17 No. 49 2004 pp 01 - 02. Published online 01 March 2004. People with low vision have residual vision with some light perception, but their vision loss does not lend itself to improvement by standard spectacles or medical or surgical treatment. Such persons have the potential for enhanced functional vision if they receive appropriate low vision care services. Traditionally, low vision services have suffered from neglect in organised eye care. Despite the efforts of some internationally recognised institutions and individuals, the coverage of low vision care and the uptake of services where available, have remained low, even in most industrialised countries. In low-income countries, the coverage has been almost negligible. This shortage is partly due to a lack of awareness about the importance of low vision services among professional groups involved in the delivery of eye care. Unattended low vision has far-reaching consequences: developmental effects in children, and functional, socio-economic and quality of life implications for all those affected across the life spectrum. However, few outcome studies have been carried out to assess the effects of uncorrected low vision or the benefits of low vision care. It is generally recognised that the problem of low vision is significant and that it is increasing rapidly, particularly in the context of the ‘greying’ of populations. However, the true magnitude of the problem is not precisely known. The reason for this lies first with the lack of an agreed definition of what comprises ‘low vision’. The second reason is that the underlying causes of visual impairment categories 1 and 2 in the World Health Organization’s Tenth Revision of the International Statistical Classification of Diseases and Related Health Problems (ICD-10) are not always reported in population-based surveys. The grades of visual impairment that currently comprise ‘low vision’ include categories 1 and 2 (Low Vision categories in ICD-10). This classification defines low vision as corresponding to visual acuity of less than 6/18 but equal to or better than 3/60, or corresponding visual field loss, to less than 20 degrees, in the better eye with best possible correction. In neither definition is reference made to near vision, which is an important function to be assessed in determining the need for, and the provision of, low vision care. An attempt has been made to break down the currently available data on visual impairment (low vision, i.e., categories 1 and 2) and blindness (categories 3, 4 and 5) to identify the magnitude of those persons requiring low vision care. Box 1 illustrates a breakdown of currently used blindness and low vision data. 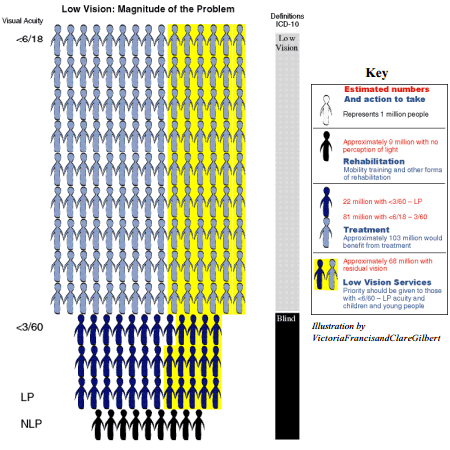 This data is based on some assumptions which would not be applicable universally, as they take into account the varying potential for surgical treatment among those who are ‘blind’, with vision of light perception or better, and among those of ‘low vision’ (categories 1 and 2) with curable causes including cataract and corneal opacities. The prevalence of blindness and of those requiring low vision care vary between regions, based on the underlying causes and the level of socio-economic and health systems development. In the absence of a clear definition applied in population-based surveys, and failure to determine the underlying causes of categories 1 and 2 of visual impairment, the data on the magnitude of low vision will remain imprecise. It is gratifying to note that the global initiative VISION 2020: The Right to Sight includes low vision care together with the correction of refractive errors among the five globally identified disease control priority areas. It is imperative to obtain reliable data on the magnitude and causes of low vision. Greater clarity in the definition of low vision, limiting it to those requiring true low vision care, would be invaluable in collecting data for planning and programmatic purposes. In addition, there is a need for a standardised protocol for use in population-based surveys, preferably as an integral part of surveys on blindness and visual impairment. There are currently an estimated 180 million visually impaired persons globally. Of these, 45 million are blind, of whom approximately 20 % (i.e., 9 million) have no perception of light. These latter persons require mobility training and other forms of rehabilitation. Out of the total of 171 million which comprises 135 million persons with ‘low vision’ (ICD-10) and 36 million blind with residual vision, (i.e., with light perception or better but less than 3/60), an estimated 60% can be improved with surgical treatment, mainly for cataract and some for corneal opacity. This accounts for an estimated total of 103 million persons who would benefit from treatment. (Note: Those requiring standard refractive correction would have been already excluded from this group by virtue of the definition in ICD-10). The remaining estimated 68 million persons require low vision care and are likely to benefit from such care.